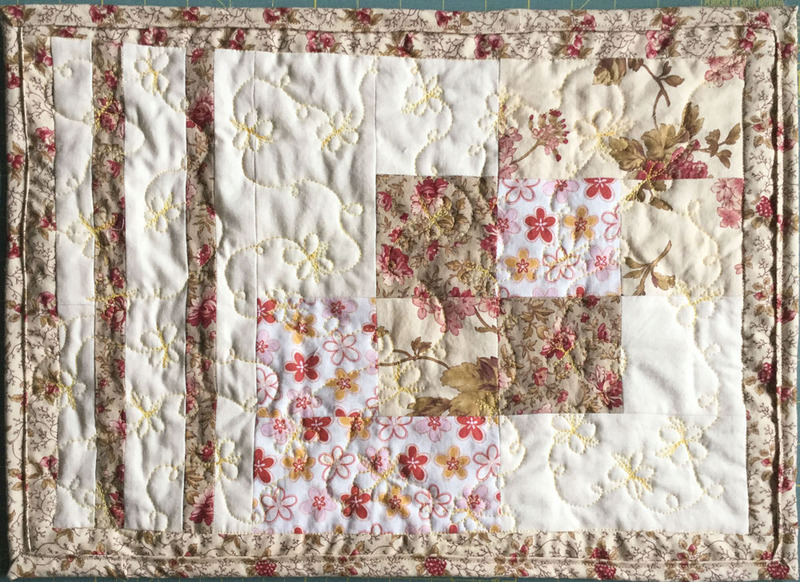 I haven't been quilting as much as I think I should. But I have been reading books (not audio or even digital). What a treat! This weekend I made a placemat for a very special friend. Tipi was one of my mother's best friends. She didn't want anything big, but said that a placemat would be great. She mentioned dark red, blue and yellow. All of the fabrics were from my stash. I did have three fat quarters from the same line, full of beautiful roses. I'm not sure that it's her style, so I added some more funky flowers to the mix. 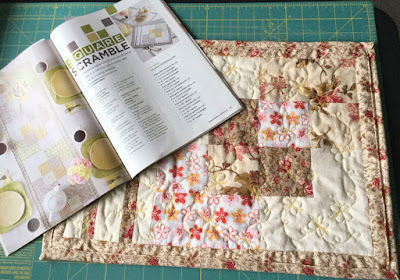 The placemat will go with whatever mood she's in - one classic and the other fun and scrappy. I used a blue and yellow Provence style fabric as well as many red, yellow and gold fabrics from my stash and scraps. I put two log-cabin type blocks together. 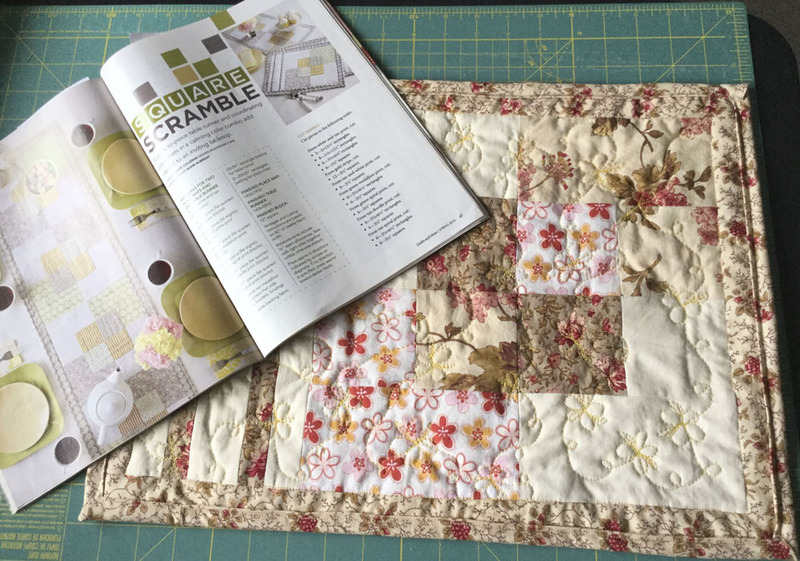 The first, more classic side, comes from the Square Scramble pattern by Kate Colleran in the Spring 2016 Quilts and More magazine. 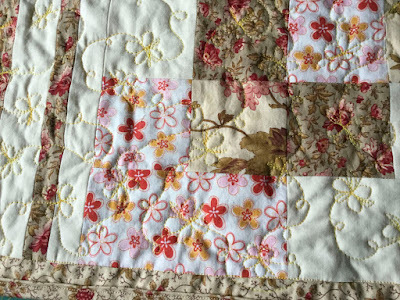 I free motion quilted (FMQ) the placemat with an all-over design of small flowers with a couple of loops. I used a slightly variegated beige thread (King Tut, 40 wt. from Superior Threads) for the top. The bobbin was another lightly variegated yellow thread. I love how the yellow shows up against the dark reds. Even when I was really careful with the cutting and piecing, my classic placemat didn't come out even. I'm really going to have to take our guild's course on sewing with accuracy. Even if it's not my idea of fun, being accurate when I'm trying would be nice! I love the two different sides of this placemat. One classy side and the other fun and scrappy. Great for any mood! 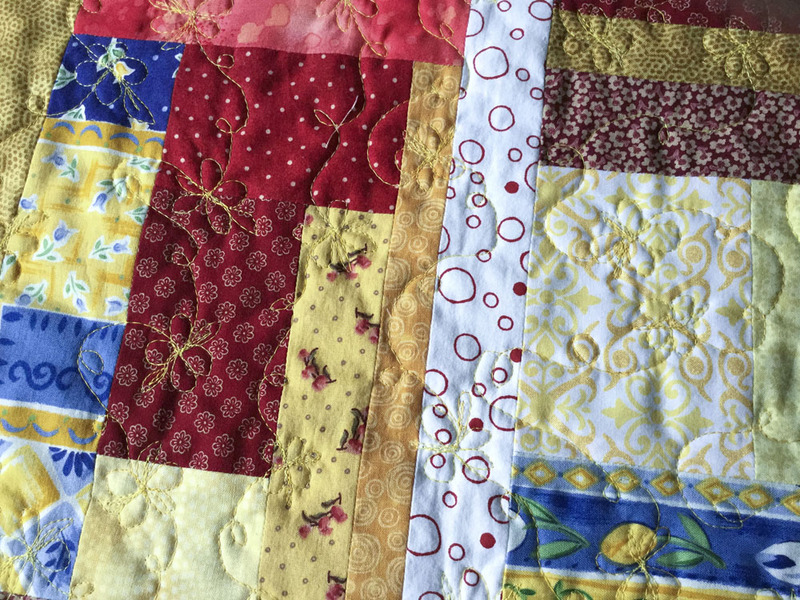 I don't often use an all-over pattern when free motion quilting. Because of the two different sides, I believe that this was the best way to go. Great News! Classy & Scrappy was featured on Free Motion Mavericks! I've had a crazy busy week with Art with Fabric on Monday and then a two-day surface design course with Hillary Rice. I can't wait to write a post about my surface design experiments, but it'll have to wait a few days, cause today we're going to Celebrate - Fêtons 150 with some amazing quilts from the Ottawa Valley Quilter's Guild Show - Festival of Quilts 2017. 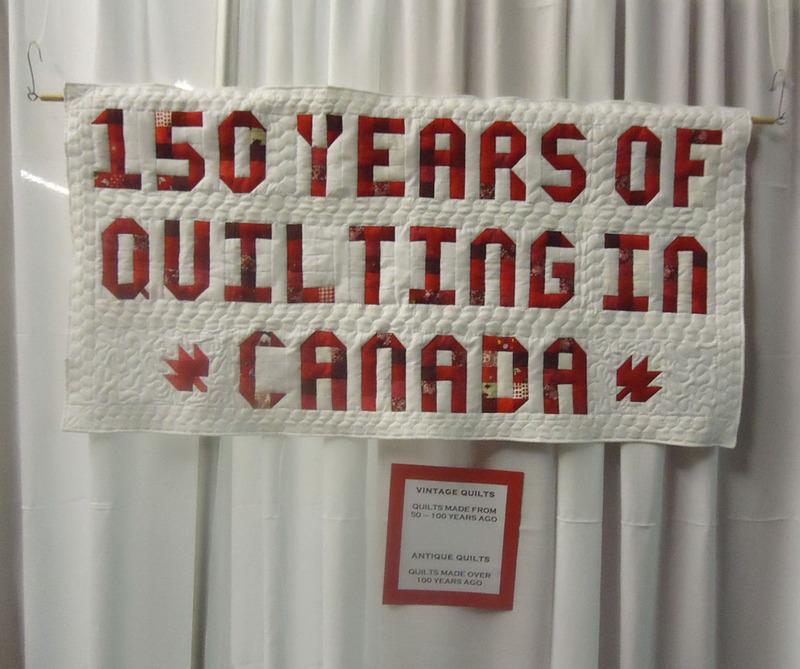 There was an exhibit of "150 Years of Quilting in Canada" at the Festival of Quilts 2017. The quilt below fits right into our theme. 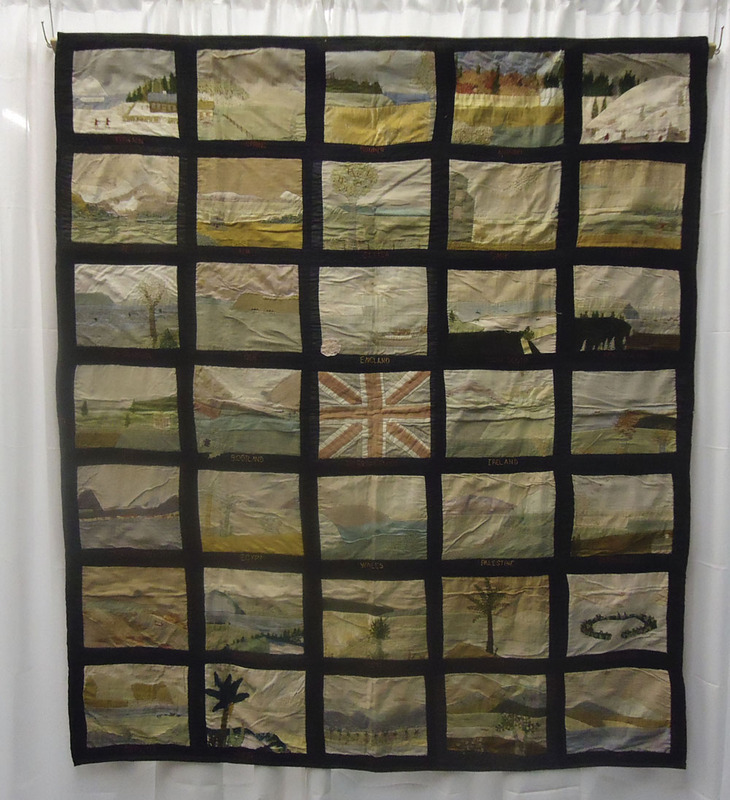 The British Empire Quilt features many of the provinces of Canada. 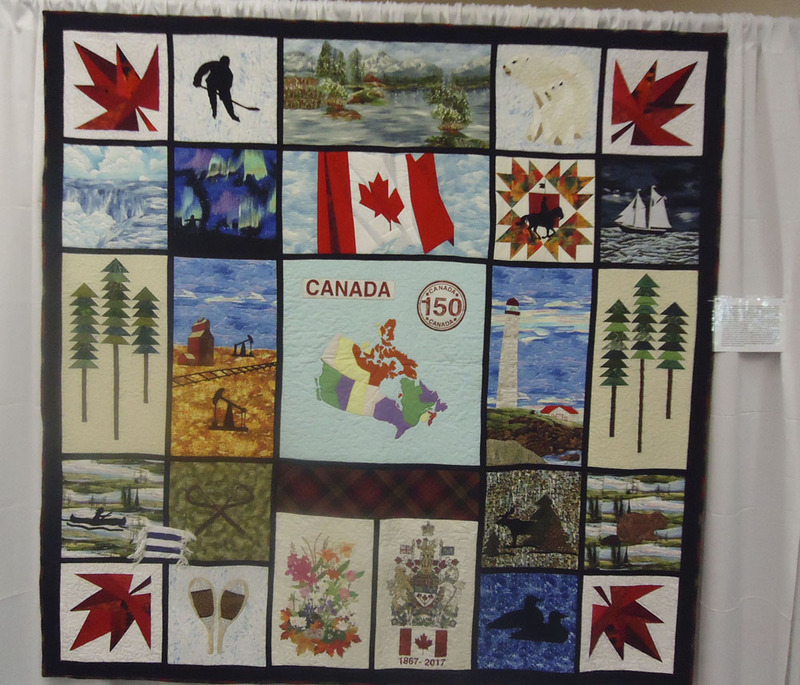 The quilt was probably completed between 1949 and 1956 since Newfoundland is included as a province. 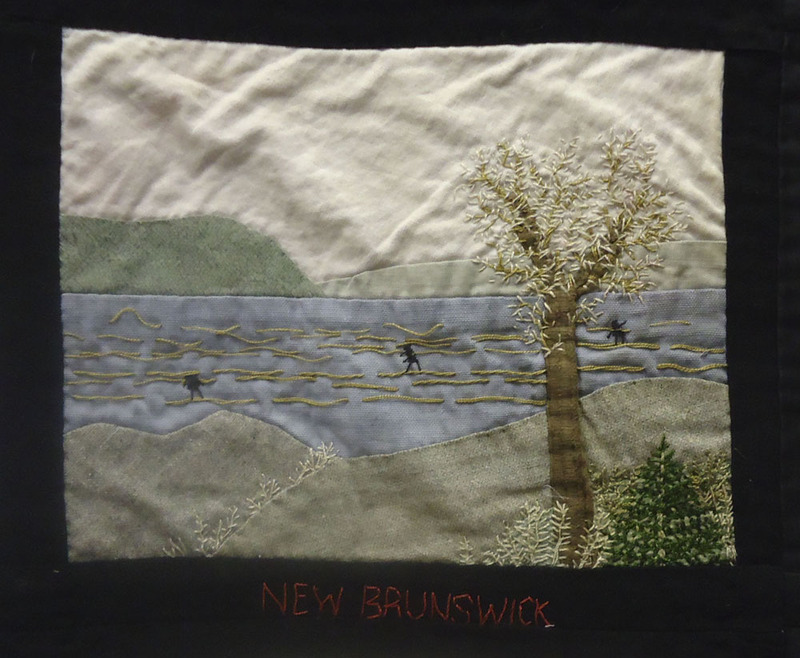 I love this block of New Brunswick since it's also part of the Ottawa region's history - "draveurs" or draftsmen taking the logs down the river. Do you remember the Common Thread Quilt Guild's Postcard Quilt? It was also part of this exhibit. Isn't it great how different the postcards are? So many different techniques and colours used. This was my Canada Goose contribution. 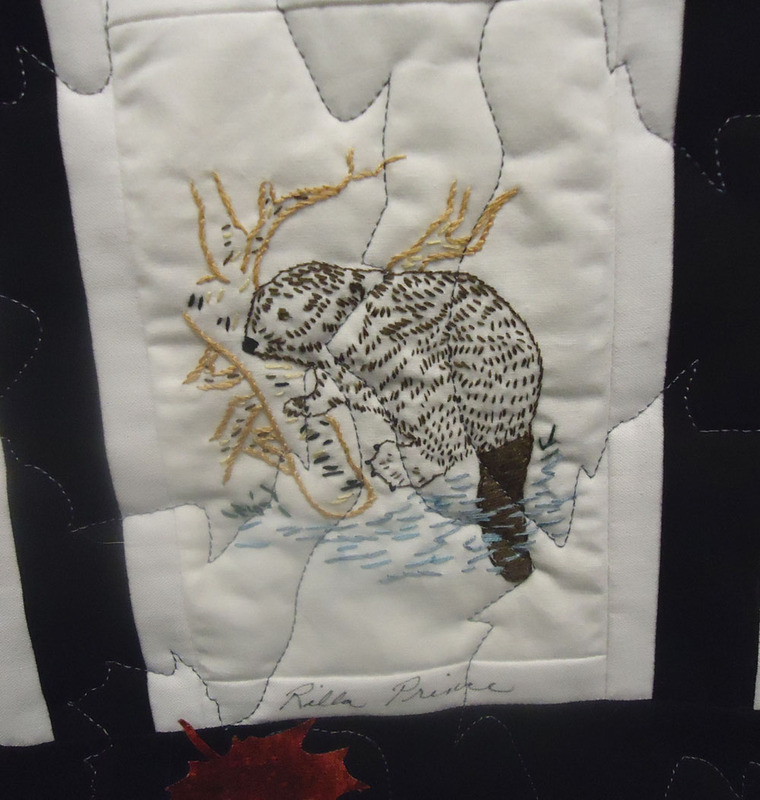 There was also a President's Challenge as part of the Festival of Quilts 2017. 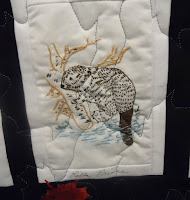 There were some incredible quilts! I will include these in a later post. 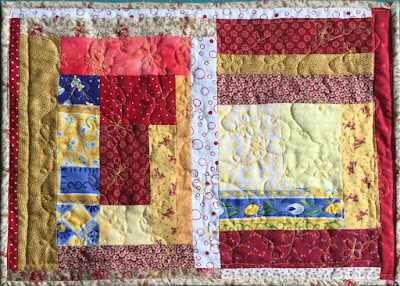 Finally, here is what I'm working on - Quilty Pleasure's Sergent Sesquicentennial block. 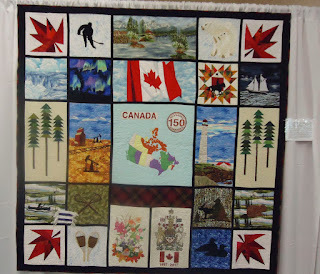 Don't forget to leave comments or to link-up your projects to the Celebrate - Fêtons 150 in May. 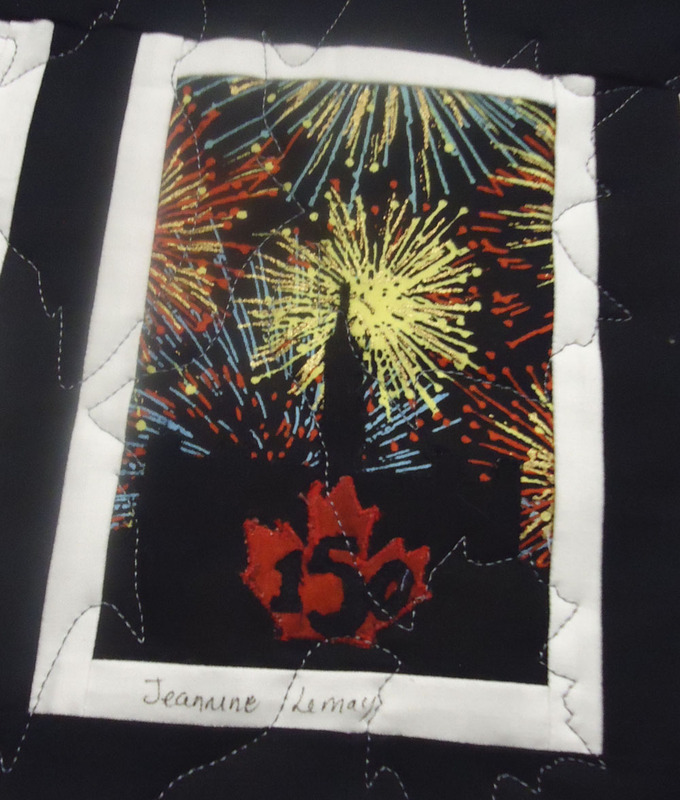 You could win your own Sergent Sesquicentennial block kit! The picture on the left was taken before I fixed the Sergent's torso. Turns out that he doesn't have very broad shoulders and a tiny waist! Here's the latest photo. I picked up some brass buttons tonight so these will be added on once the block is finished. 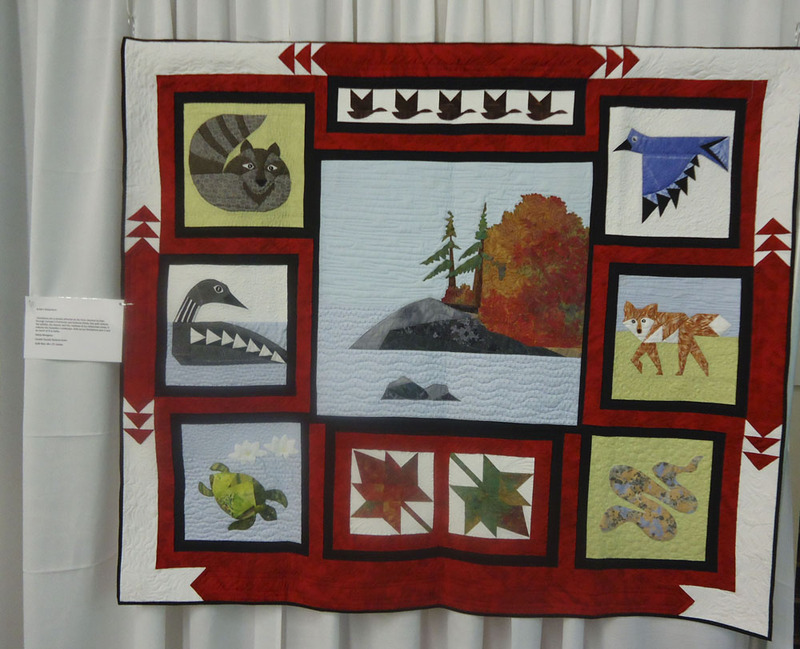 I had an amazing time at the Festival of Quilts 2017. On my first tour of the show, I took it all in. Then I took photos on the second pass. Finally I went shopping! After that I was more exhausted than if I had worked a full day! 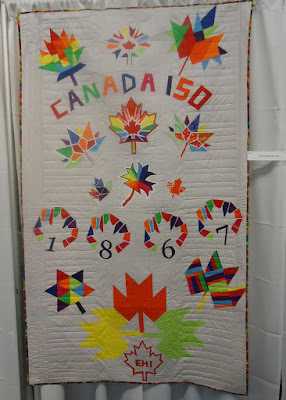 I'm really going to have to pace myself when I go to Quilt Canada! As you saw, I had some minor misshapes with the Sergent Sesquicentennial block. I really need to stop when I'm getting tired before making the mistakes. Luckily these were fairly minor - nothing that I couldn't rip out! Welcome to Art with Fabric - Spring 2017! 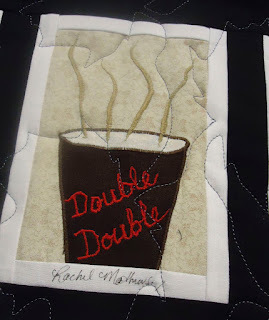 I'm thrilled to be participating in this blog hop again - thanks Alida for organizing it! It's so much fun finding an artist's work to use as inspiration. I had to find one that I liked since I spent about 4 months thinking and working on this piece. The piece I've chosen to interpret is Joyce Wieland's Reason over Passion, created in 1968. Joyce Wieland (1930 - 1998) was an amazing woman. I was introduced to her art by my daughter who studied her works in a Canadian Art History course. Joyce pushed many boundaries as an artist, film maker, feminist, and political activist. 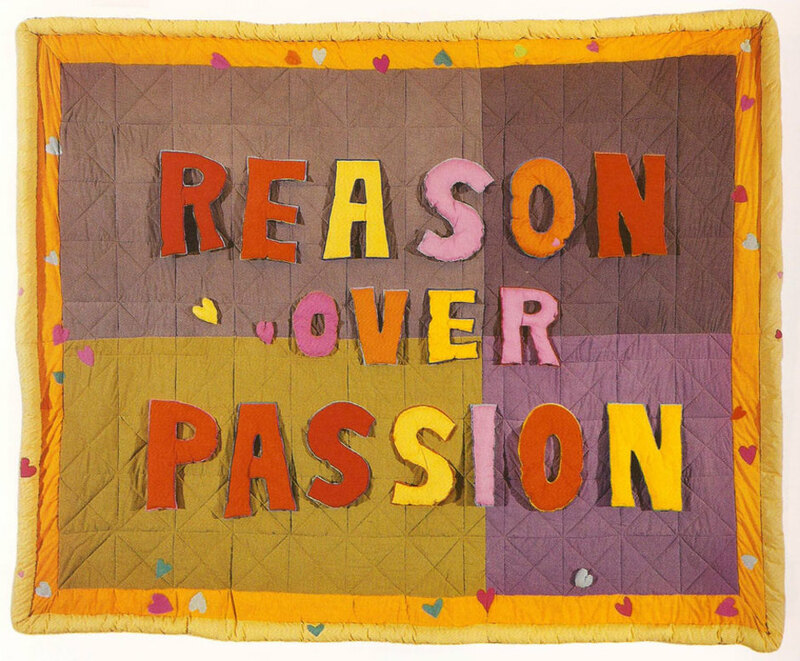 Reason over Passion was one of several textile art pieces in Joyce's True Patriot Love exhibit (1971). That show was also the first solo exhibit by a female artist at the National Gallery of Canada. You can imagine the comments from the art establishment about fabric in an art exhibit in 1971. Joyce Wieland was a pioneer, incorporating many traditional textile techniques in her work as a way of elevating "women's work". 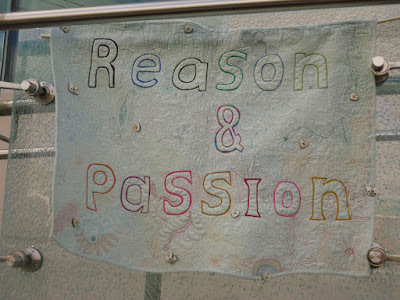 Reason over Passion was based on Prime Minister Pierre Elliot Trudeau's claim that he used reason over passion to guide his decision-making. Here's a great story about this work of art. Joyce created both a French and an English version of this piece, probably to reflect official bilingualism in Canada. La raison avant la passion was given to Prime Minister Trudeau and hung in the official residence. 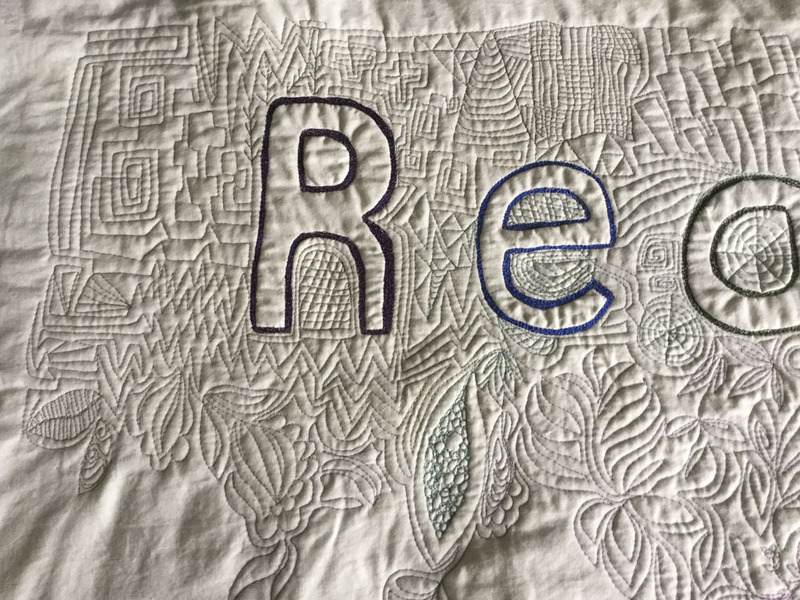 One day, his wife Margaret Trudeau pulled the letters off the quilt and threw them at her husband. 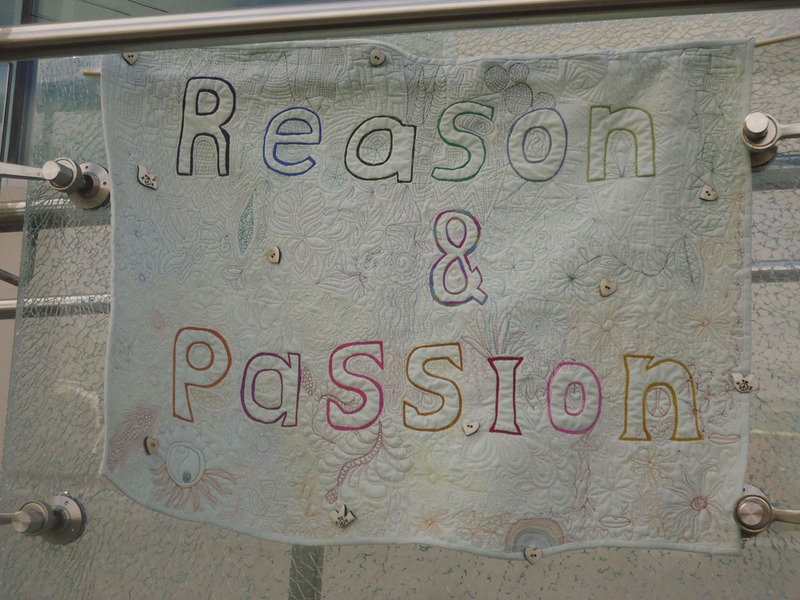 I can imagine how difficult it could have been to live with a man who lived by the motto: Reason over Passion! You can read more about Joyce Wieland in my last post and in the Related Links section below. Having thought about and worked on this piece for so long, I suspect that Joyce Wieland was being ironic when she created it. Notice that the colours she used are all in the warm palette and the hearts she placed all over it. 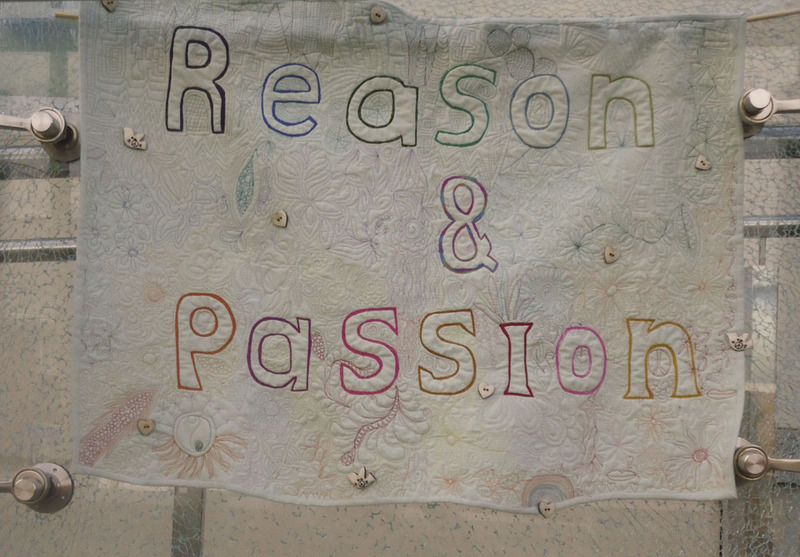 Joyce loved hearts and these are not symbols or colours linked to reason, but rather passion. 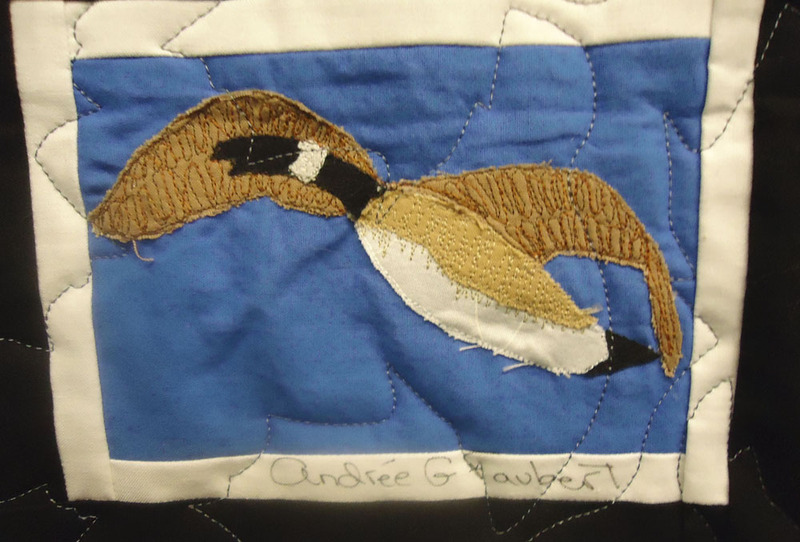 I wanted to create something different from Joyce's work - something that would reflect my thoughts and beliefs as well as the evolution of textile art. I decided to create Reason & Passion because I believe we need to balance both of these elements in our lives. Even scientists like Albert Einstein complemented their rational, reasoning side with creativity and passion in their work. 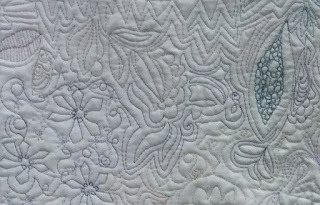 To acknowledge the evolution of textile art, I created a wholecloth quilt filled with free motion quilting (FMQ). No one will be able to throw my letters at me! 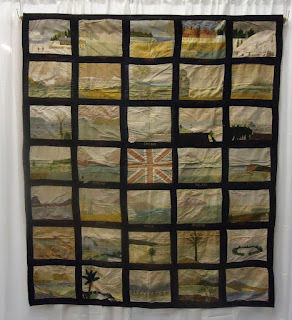 The quilt is divided in three horizontal sections. 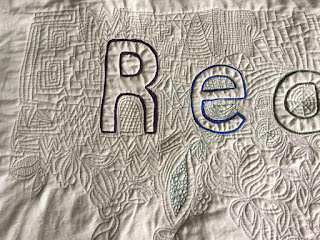 The letters and FMQ are in cool colours - blue and green with some neutrals. The FMQ motifs are geometric or linear. 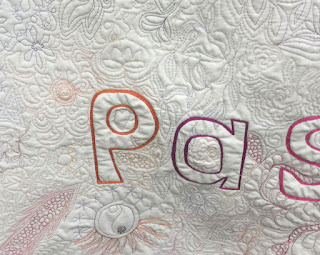 The "&" is in a bright multicoloured thread with the FMQ starting to be in warm colours such as red, pink, orange and yellow. 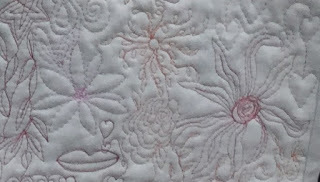 The FMQ motifs are more organic - mostly those found in nature such as flowers, leaves, stars and snowflakes. 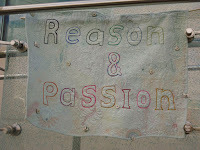 Passion is written in bright warm (or hot) colours which are echoed in the FMQ. 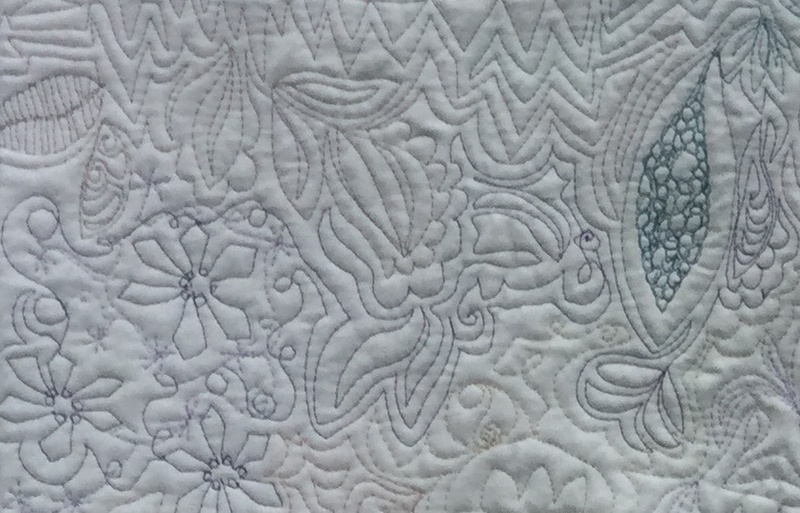 The FMQ motifs are still organic (and a little wilder) and become more abstract with the addition of paisleys and quilted feathers. There are also a few symbols that Joyce Wieland used in her works, such as lips and hearts. I also added "Yin yang" symbols throughout the piece to illustrate the wholeness that we create when we accept what are seen as opposite qualities within us, as complimentary. My passionate side is the strongest in me. I loved creating those patterns with the wild colours. My reasoning or rational side came out in the planning of this piece. It was, however, more difficult to quilt geometric patterns in cool colours. I have to thank Leah Day for her inspiring book: 365 Free Motion Quilting Designs. 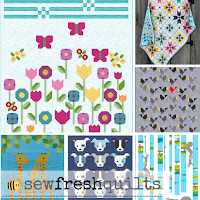 I could never have come up with all of the FMQ motifs on my own! Those who know me won't be surprised that I used a wholecloth for this project so that I could minimize the piecing and maximize my FMQ practice. A win-win combination! 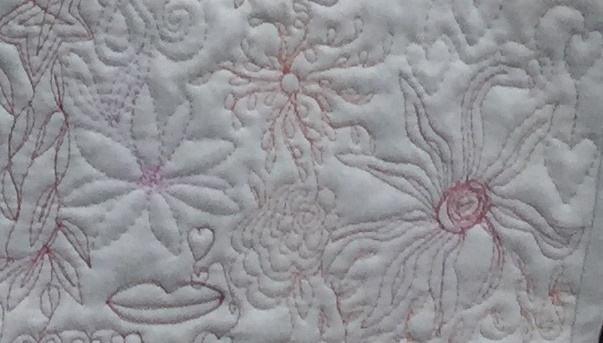 I learned many new FMQ motifs that I will incorporate in my quilting. For the letters I used size 40 threads; Madeira Polyneon, Rainbows by Superior Threads as well a Signature variegated thread. I didn't have enough colours so ended up picking up some Gütermann machine embroidery thread. It was fine and all had a nice sheen. All of the FMQ was done with Kimono Silk thread from Superior Threads (size 100), except for one flame made with Signature variegated thread. I used Superior Threads' Bottom Line in the bobbin and two 70/10 Microtex needles (that's a lot of quilting!). Since I've started using these needles with Bottom Line and Kimono Silk thread, I've had no problems with the tension. Yeah! Art with Fabric Schedule - Check out the participants' art work! 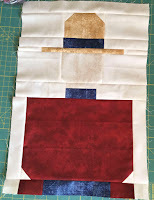 The Art with Fabric blog hop is almost upon us....and I actually finished my piece on time! 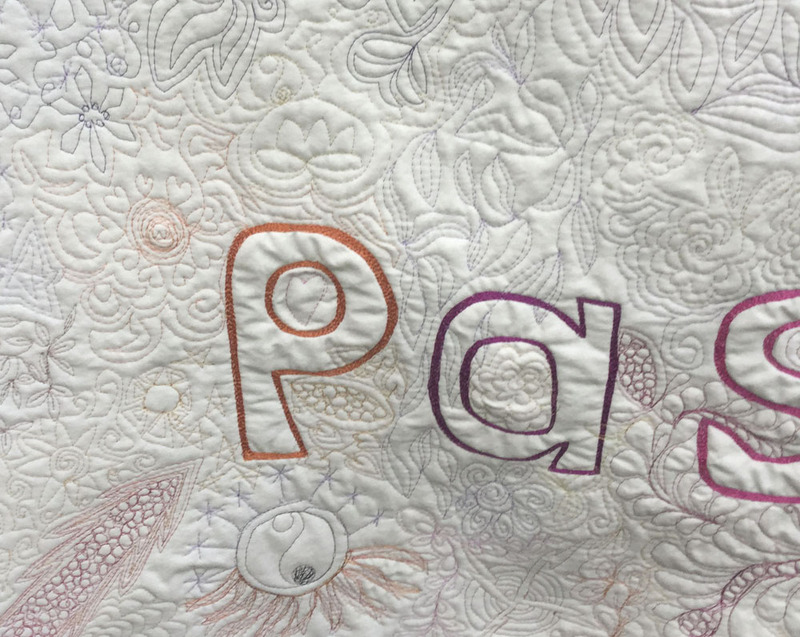 We need to send an image of our work one week before our post date to Alida of Tweety Loves Quilting blog so that she can get the blog hop ready. The picture I sent her didn't include any embellishments, but it's still very recognizable. The artist I chose is Joyce Wieland (1930 - 1998), a Canadian artist who broke many boundaries in her time. 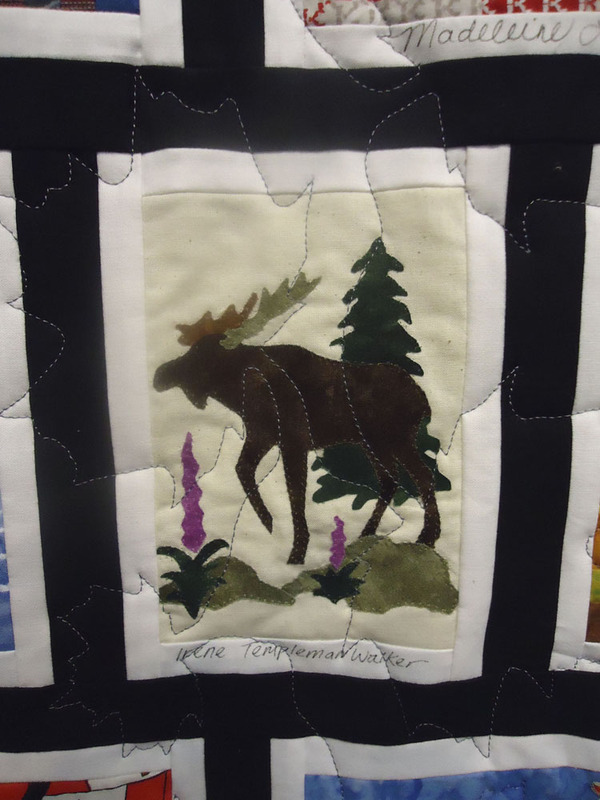 Not only was she a painter, film maker, feminist and political activist, but she also designed the first art quilts to be shown in the National Gallery of Canada's first solo exhibition by a living woman artist. 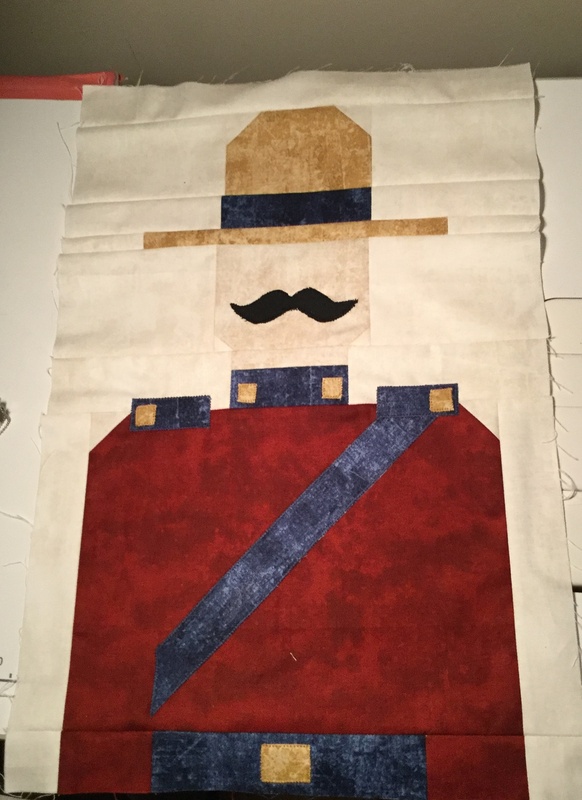 The exhibit, entitled True Patriot Love, opened on Canada Day 1971 (formerly known as Dominion Day - before the repatriation of our constitution). Here is the piece that I have interpreted. 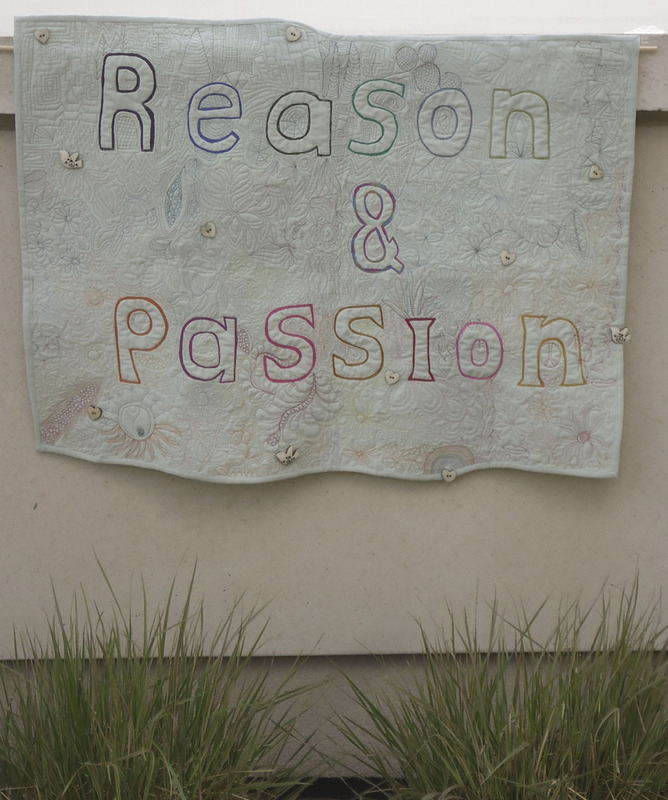 It's called "Reason over Passion" and is based on Pierre Elliot Trudeau's motto. 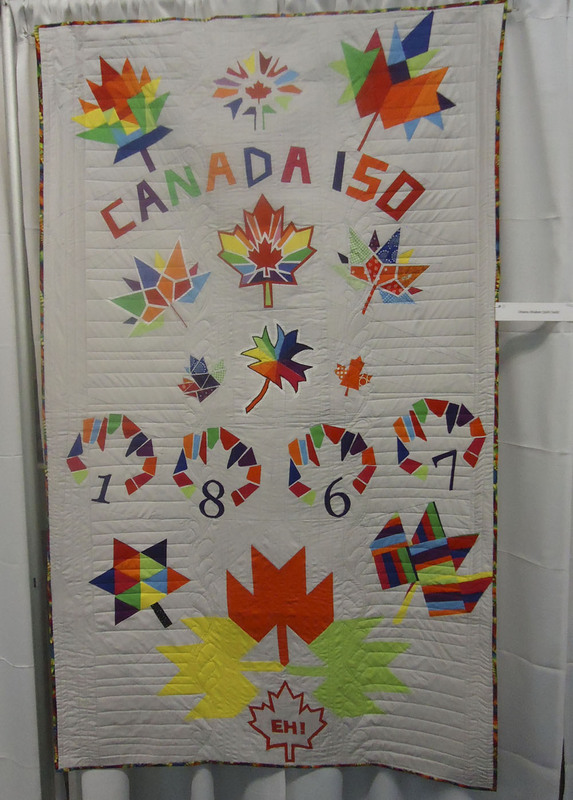 The quilt was created in 1968 in both French and English. 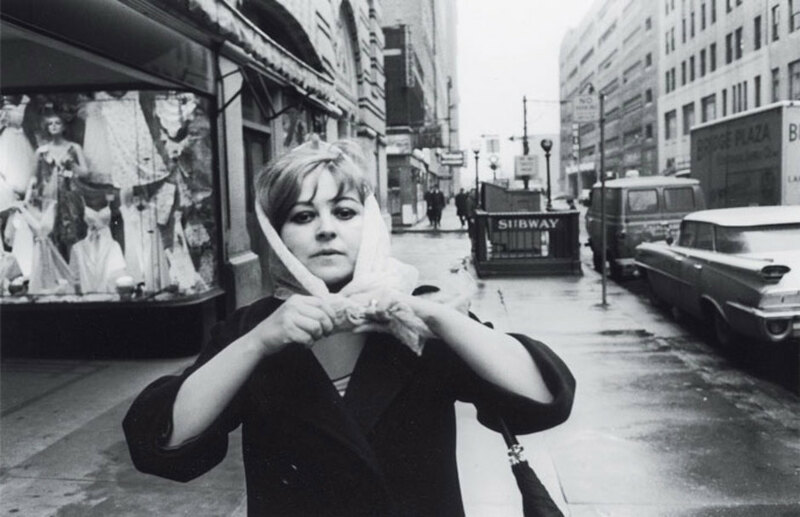 It was part of Joyce Wieland's solo exhibit the True Patriot Love of 1971. The art quilt was huge - roughly 8 1/2' x 10' (or 256.5 x 302.3 cm). 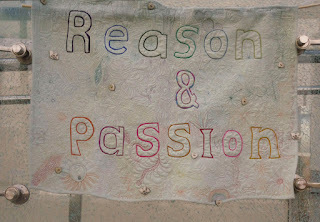 Here are a few clues to my interpretation of Reason Over Passion. You'll have to come back on Monday to see the finished product! The second clue: free motion quilting in a rainbow of Kimono silk thread. The third clue - symbolism! It's amazing how much you get to know an art piece when you look at, think about and study it for a few months. I have come to appreciate Joyce Wieland's sense of humour and irony. I'll share my quilting learning in Monday's post. April has whizzed by, bringing with it lots of rain and some time to quilt! In Ottawa it looks like May will follow with more rain. If you can't be in the garden, you may as well be playing inside with colours of your own choosing. Thank you so much for making this blogging event of success. There is so much talent and a lot of it is focused on celebrating Canada's 150th. I can't wait to showcase new ideas and projects each month. It's time for the April draw. 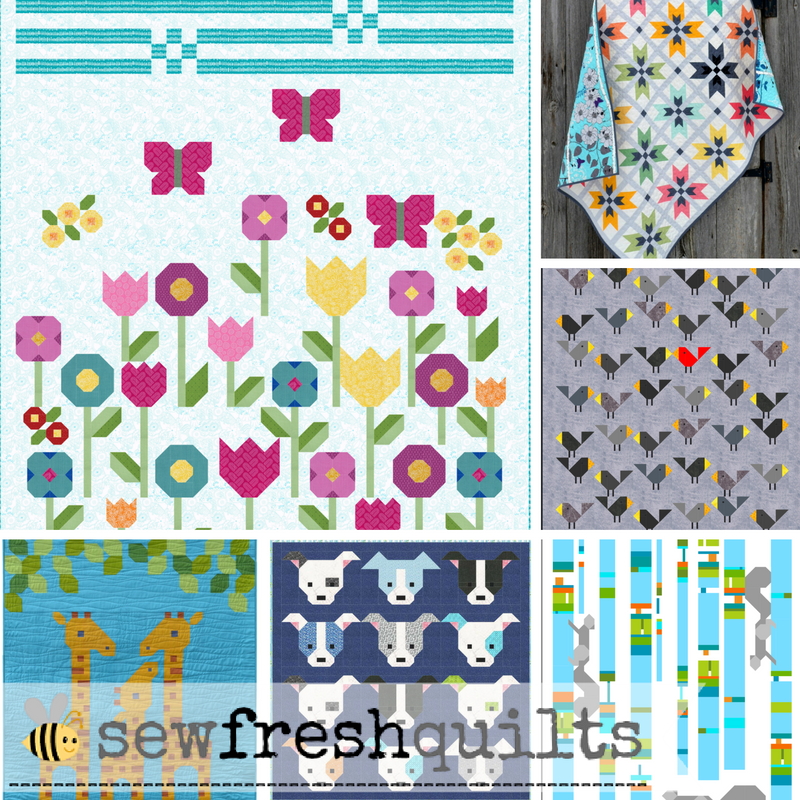 As you may remember, our April prize is a pattern from Lorna of Sew Fresh Quilts. Thank you Lorna for your generosity. 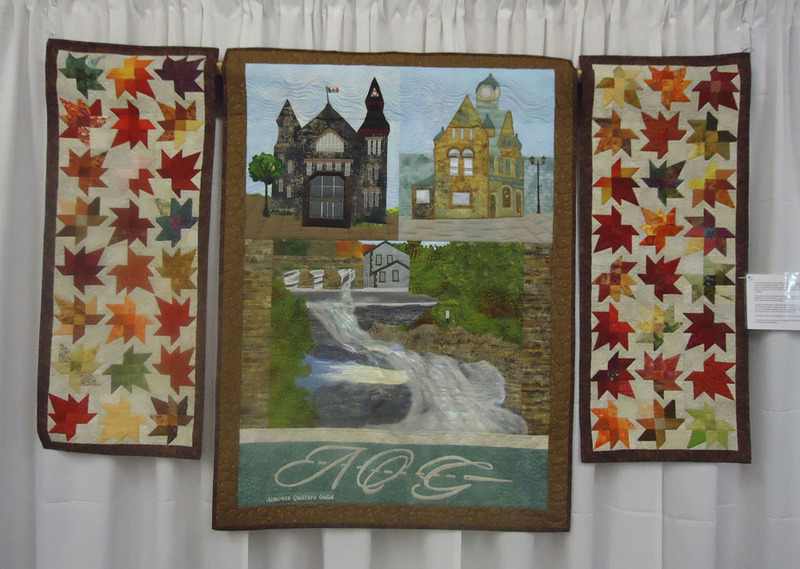 And our winner this month is Terry Aske of Terry Aske Art Quilt Studio. Congratulations! 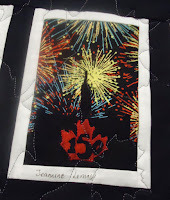 Here is my completed Celebrate - Fêtons 150 project for April. I really like the way it came out. I even tried for some "Zendoodle" type embroidery in the title. That was a lot of fun! Here is the label for this piece. I couldn't resist using the moose - he's so cute! 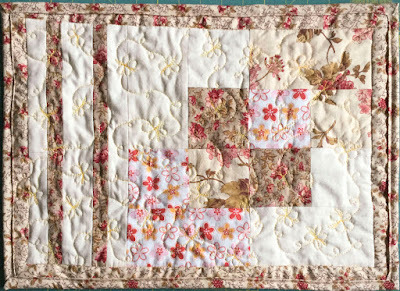 This first pattern is called Ca_na_da Quilt Pattern and is sold by Castilleja Cotton on Craftsy. For something different, here is a pattern of Sunbonnet Sue in Canada, sold by Seams To Be Sew, also on Craftsy. I hope you've enjoyed these varied patterns. There really is so much to choose from. 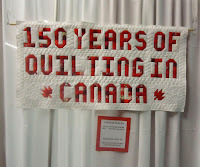 This month I'll be attending at least one quilt show and I'll tell you how they're celebrating Canada's 150! May your month be creative and fun! I will be linking this post to the May Goal Setting of One Monthly Goal (OMG) as well as other linking parties. Here they are: MOP Monday, Monday Making, Moving it Forward Monday, Main Crush Monday, Linky Tuesday, Let's Bee Social, Midweek Makers, Needle & Thread Thursday, Free Motion Mavericks, Off the Wall Friday, Can I Get a Whoop Whoop? I forgot to mention the draw for May. 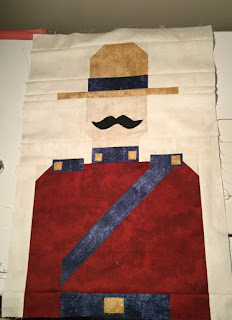 Link up your project or leave a comment on the Celebrate - Fêtons 150 in May posts and you could win a kit of Quilty Pleasure's Sergent Sesquicentennial block.